Contact us for all the information you’ll need to get moving! Life is full of exciting firsts; your first birthday, your first day of school, your first love, your first place. Whether you’re just moving out of your parent’s house, want more room to grow a family, or are simply tired of renting, buying your first home is a big step. It’s one of the biggest financial investments you’ll ever make, and if the thought of signing on the dotted line terrifies you, you’re not alone. But buying your first home doesn’t have to be a stressful and scary experience. If you do your research, take it step by step, and have the right people by your side, you can break into the real estate market with confidence. Here at Auxilium Mortgage, we do more than just provide you with financing. We help alleviate many of the fears faced by first time home buyers in Victoria BC, and provide sound, quality advice to get your new life started off on the right foot. Purchasing a house isn’t as simple as signing on the dotted line. In addition to your monthly mortgage payment, you have to factor in additional costs such as insurance, property transfer tax (if it applies), home inspection fees, appraisal fees, lawyer fees, and bills, bills, bills. The best way to figure out if you can afford to buy a house is to take your budget for a test drive. Pretend you already have that mortgage payment and those additional costs, and take that extra money and put it into your savings. By doing this, you’ll build up your confidence because you know you can handle a bigger payment. You’ll also build up your savings account, which is always a good thing. What If I Don’t Have a Big Enough Down Payment? In Canada, the minimum down payment required is 5%. And the bigger your down payment, the better off you will be in the long run. You’ll pay less interest, have lower mortgage insurance fees, and have a bigger equity buffer if home prices slide. But the truth is, most first time home buyers in Victoria BC struggle to save up a down payment. While some may have the Bank of Mom and Dad to withdraw from, others may not have that option. Luckily, there are a few other ways to get a down payment. If you don’t have your savings or monetary gifts to fall back on, you can always look at The First Time Home Buyer’s Plan (RRSPs), flex equity or vendor take backs. Don’t let bad credit stop you from buying your first home in Victoria BC. If you have low credit or bruised credit, your home-buying dream isn’t necessarily over. Even if you experienced bankruptcy, but have been discharged with reestablished credit, you can get into a new house with a little as 5% down. If you don’t have the reestablished credit but have a larger down payment, there are a few creative financing options you can explore! As mortgage brokers, these are just a few of the questions we hear from first time home buyers in Victoria BC. We know you have many more, which is why we created an instantly downloadable eBook that answers the most frequently asked questions in an easy-to-understand way. 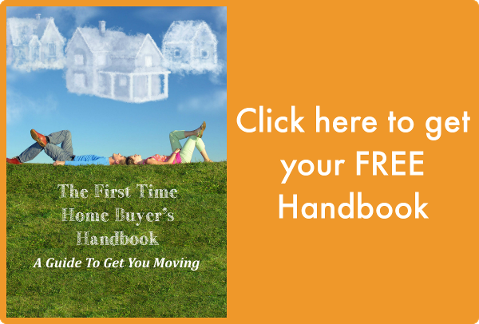 The First Time Home Buyer’s Handbook: A Common Sense Guide to Going from Renter to Owner is an indispensable tool that explains everything you need to know to reap the rewards of homeownership. Download it for free by filling in the form to the bottom. If you want to know more about buying a house in Victoria BC for the first time, or would like to meet with a mortgage broker, feel free to give us a call at (250) 590-6520 , submit an online contact form or drop by our office. Start Your Online Application Learn More & get Pre Approved Today!